Crowds of people braved the searing heat on the BTO stand at the Rutland Birdfair to witness the launch of the inaugural 'Bird Photographer of the Year' competition by BTO President, Chris Packham. Along with Andy Clements, CEO of the BTO, and Bird POTY Director, Andrew Cleave MBE, Chris held the crowd transfixed as he talked passionately about two of his biggest interests in life; birds and photography. Chris Packham said, "As a judge on the panel of people who will choose the winning photographs, I can’t wait to see the entries. The title of 'Bird Photographer of the Year' is a prestigious one and I envisage seeing some of the best bird photographs that I have ever seen." From now until the closing date of 9 January 2016, the competition is open to professional and amateurs alike and to entrants of all ages. Indeed, if you are under 18 before the closing date, then your entry will be entered into the 'Cameron Bespolka Young Bird Photographer of the Year' special award, as well as the main competition itself. Competition coordinator and NPL library manager, Rob Read, commented, "We have been astounded at the huge amount of interest that the competition has already generated and entries have started to flood in since the launch. We hope that the competition becomes established quickly as an annual event that people look forward to participating in year after year." There are eight competition categories and two special awards offering plenty of opportunities to win. The overall winner will receive the top cash prize of £5,000 and the title 'Bird Photographer of the Year'. A further cash prize of £2,000 is offered to the photographer with the highest scoring portfolio of six images. There will be further prizes of equipment, clothing and portfolio reviews and special thanks go to our sponsors, Swarovski Optik, Alamy and Country Innovation, for providing these prizes for the category winners and runners-up. The 'Cameron Bespolka Young BPOTY' title will go to the best image by an entrant 18 or under, as judged by our panel of experts, and will receive equipment from Swarovski Optik and a day birding with BTO staff member, Paul Stancliffe. 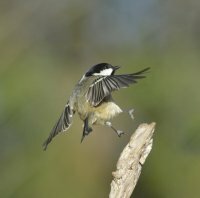 A selection of the winning and short-listed images will feature in a lavish book celebrating the competition, to be published in conjunction with the BTO in time for the Birdfair 2016. BTO President and competition judge, Chris Packham, will be writing the foreword for the book. Negotiations are in hand for an exhibition of a selection of the competition entries at a national venue. Details are to be announced. Through celebrating the bird life in photographic form and rewarding the most skilled bird photographers, 'Bird Photographer of the Year' hopes to raise awareness of the importance of bird conservation and the effects of environmental change on bird life. To help get this new and exciting competition off to a flying start, the organisers are offering a discount on entry fees of 30% off to anyone entering the competition before 30 September 2015. Visit www.birdpoty.co.uk for more details and to enter the competition.